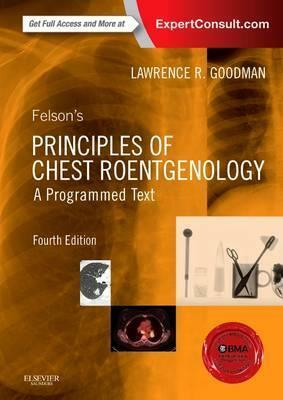 Popular for its easy-to-use format, Felson s Principles of Chest Roentgenology remains the must-have primer of chest radiology. With the inclusion of the latest imaging approaches and terminology, its unique programmed learning approach presented in a highly interactive style demystifies reading and interpreting radiologic images. High-quality images and diagrams are accompanied by multiple-choice review questions to reinforce key concepts. Additional online images plus self-assessment tests help you sharpen your skills and build confidence! Quickly grasp the radiology fundamentals you need to know-including basic science, image interpretation, and terminology-with the popular "programmed learning" approach, which promotes fast learning and reference. Discern the nuances between modalities by comparing CT and MR images as well as traditional radiographs. View detailed clinical images covering all the image types you'll see on the boards including digital quality radiographs and an introduction of PET imaging, plus more advanced imaging such as CT and MRI than ever before. Test your skills and simulate the exam experience with updated content aligned with the new MCQ-format Board exam for easy preparation and review. Benefit the from more robust interactive offerings in an e-book format-with easy-to-access quizzes and board questions provided online. "Overall this is a great introduction to thoracic radiology and an especially fast and enjoyable way to learn to interpret chest X-ray. The quiz-based learning style forces you think for yourself and makes it impossible to read without having to process the given information.? "Overall this is a great introduction to thoracic radiology and an especially fast and enjoyable way to learn to interpret chest X-ray. The quiz-based learning style forces you think for yourself and makes it impossible to read without having to process the given information."